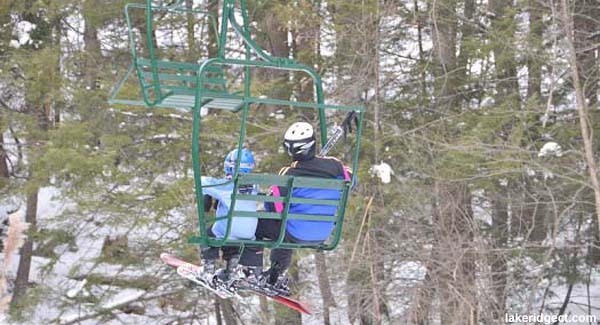 One of only a handful of chairlift served facilities in Connecticut, Lakeridge is a private community ski area located in Torrington, west of Hartford. Lakeridge likely dates back to 1970, when George L. Giguere started designing a real estate development northeast of Torrington, Connecticut. The Lakeridge Development Company was formed by Giguere and U.S.F. Constructors, Inc. as construction on the 472 unit complex adjacent to Burr Pond commenced circa 1972. Two years later, a winter sports activity center was developed on the side of a 1,195 foot high hill west of Burr Pond. For non-skiers, a skating pond was opened. For skiers, the Lakeridge Slopes were built in 1974. Serviced by a new Borvig double chairlift, the small ski area included two slopes complete with snowmaking and night skiing lights. The ski area likely opened in the winter of 1974-75. A third trail was likely added sometime after 1982. The Lakeridge ski area continues to operate privately to this day.